On December 22nd, the Bureau of Economic Analysis released the “third estimate” of the Q3 2015 Real GDP for the United States. It increased at an annualized rate of 2.0% compared to 3.9% for Q2. The nominal or current-dollar GDP (chained on 2009) for Q3 increased by $146.5 billion to $18,060.2 billion, a gain of 3.3%. The Q2 current-dollar GDP rose by 6.1% or $264.4 billion. • Personal consumption expenditures, the largest category, were up by 3.0% compared to 3.6% in the previous quarter. Goods were up 5.0% and Services were up 2.1%. • Fixed investments posted a gain of 3.7% in Q3, down from 5.2% in Q2. Nonresidential investments for Q3 were up 2.6% and residential investments rose 8.2%. Both had lower levels of growth than Q2. • Exports posted a gain of 0.7% for Q3 compared to 5.1% in Q2. Goods actually declined by -0.9% while services increased by 3.9%. • Imports recorded an increase of 2.3% in Q3 compared to 3.0% in Q2. Goods increased by 2.3% while services posted a 6.4% increase. (Note: Imports are subtracted from the value of the GDP). • Government consumption increased by 1.8% in Q3 compared to 2.6% in Q2. Federal spending was flat with a decrease in national defense spending and an increase in Nondefense spending. State and local government spending posted a 2.8% gain, down from 4.3% in the prior quarter. Q4 2015 Real GDP is expected to be stronger than Q3 and the rate of growth for 2015 will be in the range of 2.3% to 2.5%. Which has the Top Economy – Colorado, Utah, Washington? There are frequent references in the local media about how Colorado is one of the top state economies in the country. And it is! There are many metrics that can be used to compare state economies. The two best metrics are the growth rates for Real GDP and employment. In this post we look at these metrics from 2005 to the present for Colorado, Utah, Washington and the U.S.
• Washington has the greatest number of employees, followed by Colorado. • Utah had the highest rate of employment growth of the three states. 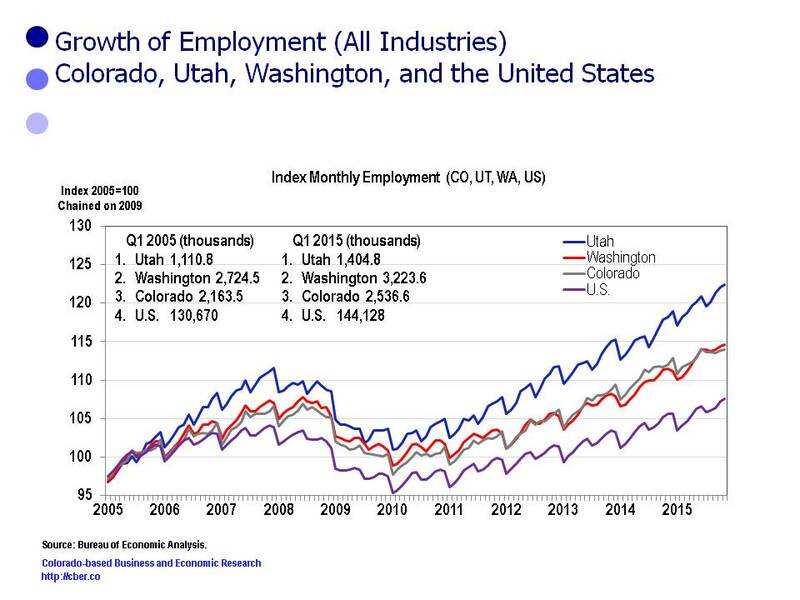 Colorado and Washington have grown at similar rates; however, Washington’s rate of growth has been off a larger base of employment. • Employment for all three states has grown at a faster rate than the U.S. That rate of growth has accelerated since 2010 for all three states. • Washington has the largest GDP, followed by Colorado. • The Real GDP for all three states has grown at a higher rate than the U.S.
• Utah had the fastest rate of Real GDP growth from 2005 to present followed by Washington. Colorado is third. • Since the end of the recession the GDP for all three states has grown at a faster rate than the United States. Colorado had the fastest rate of Real GDP growth from 2013 to present because of the rapid growth in the extractive industries. That rate of growth is likely to decrease in 2015 and beyond as a result of challenges facing the oil and gas industry caused by lower oil prices. Based on these metrics Washington has the largest economy and Utah is growing at a faster rate than the other two states. The strengths of the economies in Utah, Washington, and Colorado make them great places to live, work, and play. Here’s to a prosperous year for all three states in 2016. On December 21st, the Colorado Legislative Council (CLC) and the Governor’s Office of State Planning and Budgeting (OSPB) released their quarterly 2016 economic forecast . (https://www.colorado.gov/cga-legislativecouncil and https://sites.google.com/a/state.co.us/ospb-live/). The two reports provide slightly different estimates for 2015 and forecasts for 2016, both of which are supported by rational explanations. A comparison of the 2015 estimates for key indicators follows. At the national level, the major difference is that OSPB expects U.S. unemployment to be slightly higher. • Both organizations have indicated stronger than anticipated population growth. • CLC projected employment to be near the current levels published by the Bureau of Labor Statistics. OSPB projected employment to be near the estimated benchmark revisions that will be made in March. • Inflations in Colorado is much higher than the U.S. OSPB’s projection for employment is slightly higher than the CLC projection. • OSPB is more optimistic than CLC about the number of construction permits issued in 2015. At the national level, the two groups have similar forecasts. OSPB forecasted slightly higher U.S. inflation than CLC. • Both groups are projecting population growth similar to 2015. • Both groups are forecasting continued job growth; however, it will be at a slower level. There are drastic differences in the projected employment levels. • OSPB is much more optimistic that CLC about construction growth. • Inflation will be about one percentage point greater than the U.S. level. The bottom line is that the state is expected to show continued job growth. The question is whether or not it will be at a level that is weak to average or will be average to modest growth. The Bureau of Labor Statistics released wage and salary employment data for November that shows the level of Colorado job growth continued to deteriorate. In October, the jobs data reported there were 49,000 more jobs than 2014 and the difference for November was 43,600 jobs. The current employment data shows the state is on track to add 57,000 jobs in 2015. Henry Sobanet, Director of the Governor’s Office of State Planning and Budgeting recently stated the slowdown in the rate of job growth could be attributed to two things – the lower price of oil and the slower growth in the Chinese economy. In other words, the slowdown is a “bump in the road” and not a major recession. • About 78.8% of the total jobs added were in the top five sectors: Health Care; Accommodations and Food Services; Construction; Professional, Scientific, and Technical Services; and Financial Activities. • Approximately 24.8% of all jobs added were in Leisure and Hospitality (Accommodations and Food Services plus Arts, Entertainment, and Recreation). • About 10.9% of total jobs added were in the PST, Manufacturing, and Information Sectors. These sectors are the source of primary and advanced technology jobs. Projected revisions, which will be made in March 2016, are estimated to bring Colorado job growth closer to the lower limit of the 2015 cber.co forecast, a forecasted increase of 73,000 to 79,000 jobs. The total number of unemployed workers at the end of November 2015 was 102,035. The total number of unemployed is 8,306 greater than the trough in May 2007 and 138,542 less than the peak in October 2010. Lower unemployment rates have brought about shortages of trained workers in key sectors and occupations. The November 2015 unemployment rate of 3.6% is down from 4.3% in November 2014. In addition there are 19,567 fewer unemployed workers compared to a year ago. The lower unemployment rates across the state are a mixed blessing. On the positive side, workers who are on the sideline will have more and better opportunities to find a job if their skills match the current openings. It is also likely that upward wage pressures my make it possible for them to be paid higher wages. On the downside there will be greater turnover at companies as people jump to “better” jobs, which may reduce productivity and drive up operational costs. Looking ahead, 2016 stands to be a solid year if the unemployment rate will stabilize and job increases will be stronger than they were in the second half of 2015. 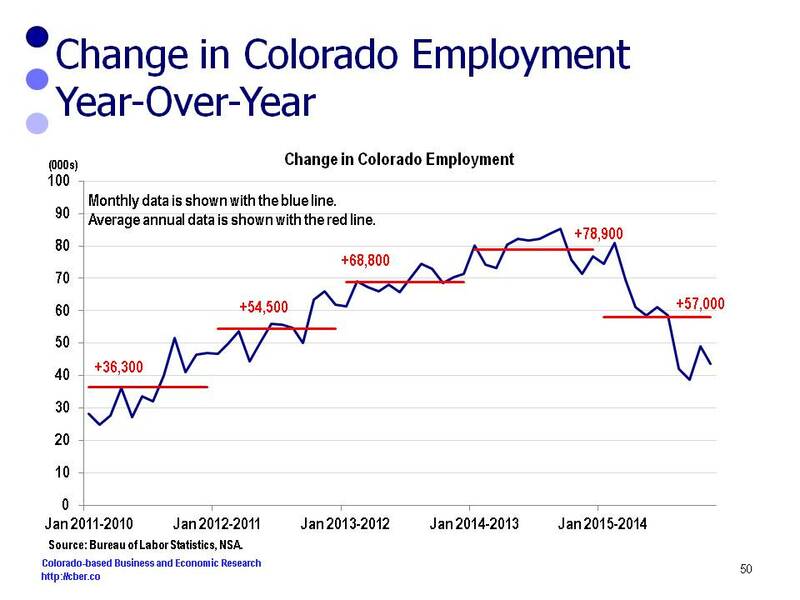 Earlier today the Bureau of Labor Statistics released employment and unemployment data Colorado. It was a mixed blessing. The Colorado unemployment rate for November dropped to 3.6%, down from 3.8% in October and 4.3% a year ago. Nationally, the unemployment rate declined in 45 states compared to a year ago. By contrast only 27 states have rates lower than October. Colorado’s seasonally adjusted unemployment rate has been at or below 4.2% since December 2014 and there is little room for it to drop much further. For job hunters this is good news as long as their skills match the available jobs. In addition, there will be upward wage pressure for occupations facing a shortage of qualified workers, such a construction, machining, and technicians. On the other hand, the lower rate may be bad news for some companies. They may have greater difficulty finding qualified and clean workers. As a result they may have to pay higher wages for skilled positions. In addition, there is greater employee turnover during times of lower unemployment. This may decrease productivity and increase recruitment, hiring, and training costs. These increased costs will lead to lower profit margins and increased prices. 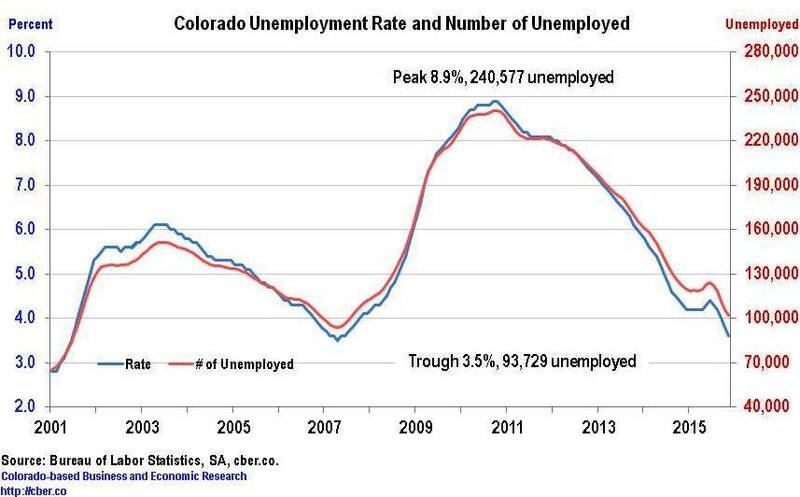 At the end of November there were 102,035 unemployed workers in Colorado. This is only 8,306 greater than the trough in May 2007 and 138,542 less than the peak in October 2010. Despite the lower unemployment rate, November wage and salary job growth was lackluster, only 43,600 greater than a year ago. 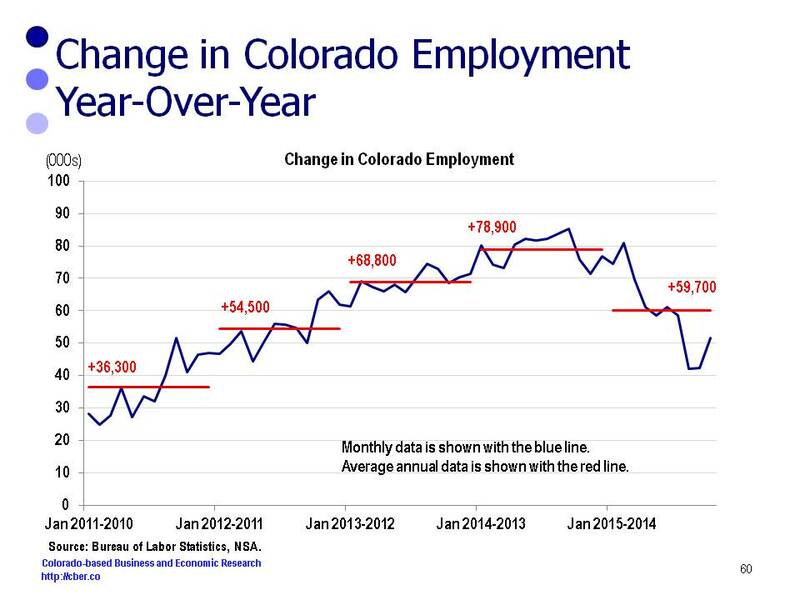 During the first half of 2015 Colorado employment increased at an average monthly rate of about 5,600 jobs. That average has dropped to 3,900 jobs during the second half of the year. Even with the declining rate of job growth Colorado will add 55,000 to 60,000 jobs this year – prior to BLS benchmark revisions that will be released in March 2016. 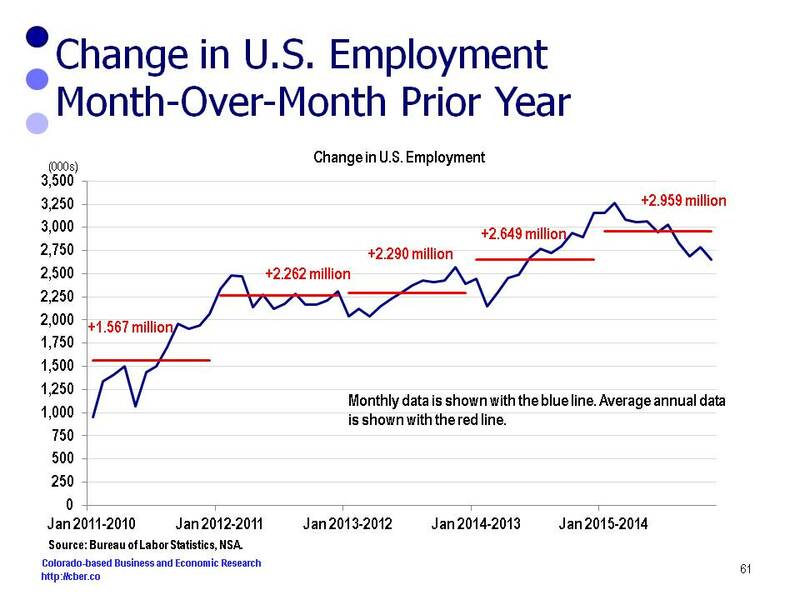 Those revisions may push 2015 average employment to 70,000+. The leading sectors for job growth are Health Care, Accommodations and Food Services, and Construction. As the level of job growth has tapered off there has been an increase in the number of discussions about a recession; however; the Fed’s recent decision to hike interest rates suggests the economy is on solid footing and a recession will not occur in the short-term. Colorado Real GDP Currently Stronger than U.S.
On December 10th, the Bureau of Economic Analysis (BEA) released quarterly GDP data for Colorado (2005 to Q2 2015). The Q2 year-over-year Real GDP for Colorado increased by 4.8% compared to 2.7% for the U.S.
• The U.S. was stronger during the period Q1 2006 through Q1 2007. 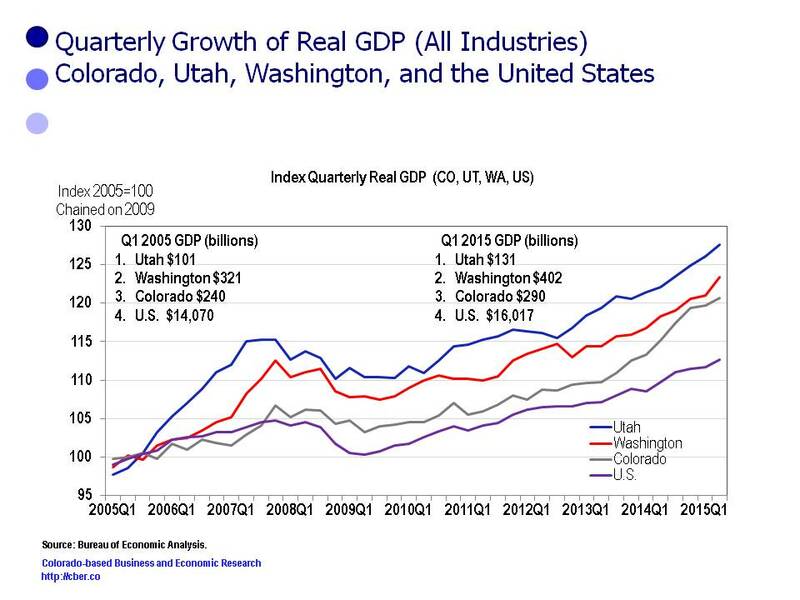 • Colorado outperformed the U.S. significantly between Q2 2007 and Q4 2009 (This was during the recession). • The U.S. was stronger coming out of the recession for most of 2010 – from Q1 2010 to Q3 2010. • For the next two years, from Q4 2010 to Q3 2012 the rates of growth for Colorado and the U.S. were similar. 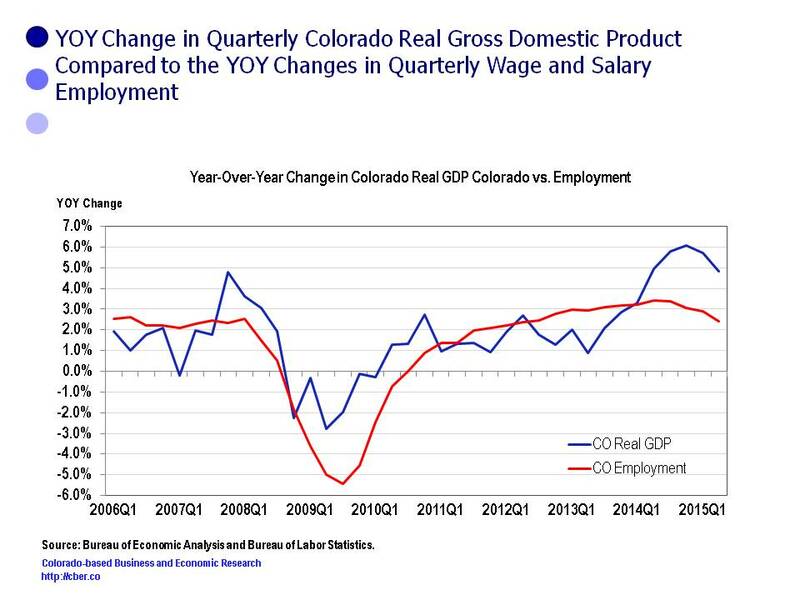 • From Q4 2012 to the present, the Colorado GDP expanded at a faster rate than the U.S. GDP. Beginning in Q1 2014 the gap between the two rates became greater as a result of the strength of the oil and gas industry in Colorado. • That gap has since narrowed in 2015 as the price of oil has declined and oil and gas production has fallen off. • Employment grew at a higher rate from Q1 2006 to Q2 2007 than the Real GDP. • Generally, the Real GDP grew at a greater rate from Q3 2007 to Q2 2011 than employment growth. • From Q3 2011 to Q1 2014 the rate of growth for employment was generally greater than the Real GDP growth. • From Q2 2014 to present the Real GDP grew at a greater rate than employment. This was in part largely because of the increase in oil and gas production in Colorado during this period. • As the price for a barrel has dropped and oil and gas production has fallen off the gap between the two rates has declined. This caused a much greater decline in the growth rate for GDP than employment. 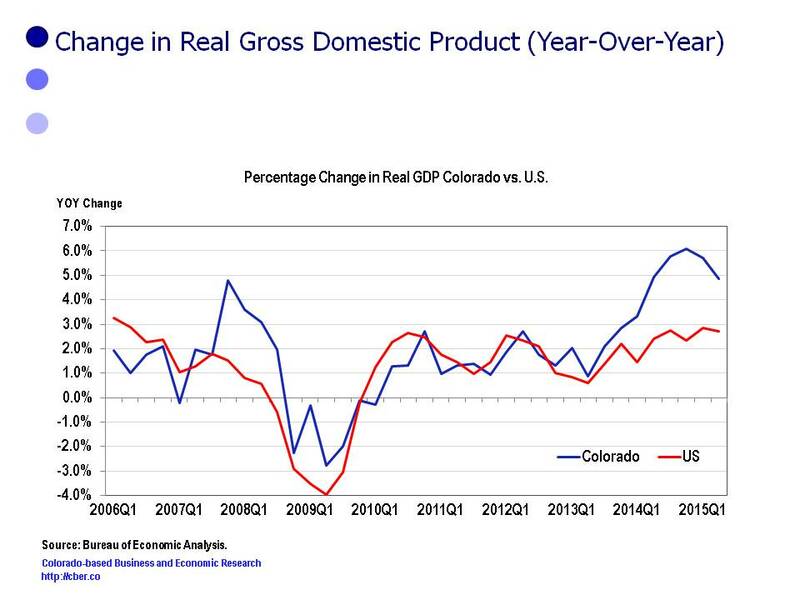 As can be seen the growth of the Colorado Real GDP and the U.S. Real GDP are closely related. As well, there is a strong relationship between the rate of growth for state Real GDP and employment. On December 4th, the Bureau of Labor Statistics released its monthly update for U.S. nonfarm payroll employment for November. The number of non-seasonally adjusted jobs increased by 2,650,000 in November compared to a year ago. Based on current trends, the U.S. is on track to add 2,959,455 jobs in 2015.That equates to about 269,000 workers per month. The November unemployment rate remained at 5.0% down from 5.8% a year ago. There were 7.9 million unemployed compared to 9.0 million last November. A look at the seasonally adjusted data shows that job growth occurred in construction, professional and technical services, and health care. Losses occurred only in the mining and information sectors. • Construction employment posted a gain of 46,000 in November. About 26,000 of those jobs were in the residential specialty trade contracting subsector. Year-over year construction employment is about 259,000 workers greater than last November. • Professional and technical services added 28,000 jobs in November. About 11,000 jobs were in accounting and bookkeeping services and 5,000 were in computer systems design services. Compared to a year ago, the PST sector is about 298,000 jobs greater than the same period in 2015. • Health care employment for November was 24,000 greater than October. About 13,000 workers were added in the hospital subsector. On a YOY basis health care employment is about 470,000 greater in 2015. • Employment in food services and drinking places increase by about 32,000 jobs in November and it is up by 374,000 greater than a year ago. • Combined, the four sectors mentioned above show job gains of about 1.4 million compared to a year ago. • Compared to the prior month there was little change in the following sectors: manufacturing, wholesale trade, transportation and warehousing, financial activities, and government. All eyes will continue to be on the Fed and their meeting later this month. Although U.S. employment has increased at a decreasing rate through 2015, the latest BLS report is probably strong enough for them to finally announce a hike in short term interest rates. The following list identifies the top output categories for Colorado. The list has been extracted from an IMPLAN database, www.implan.com. This database divides output and employment into 440 categories. IMPLAN is an economic analysis tool that uses input-output analysis in combination with regional specific Social Accounting Matrices and Multiplier Models. This list provides insight into the industries that drive the Colorado economy. As can be seen finance is a major contributor to the state’s output. Other key categories are food services, extractive industries, construction, government, health care, and advanced technology. Total output for the model was $488,356,072,817 and employment was 3,235,493. These 25 categories account for 46.4% of employment and 53.8% of output for the state. Colorado Employment Increases by 13,000 jobs in October – Really? On Friday November 20th, the BLS released wage and salary employment data for the states. The seasonally adjusted data indicated that Colorado employment increased by 13,000 jobs last month. This is in sharp contrast to the previous three months. The data for July showed a gain of 600 jobs; an increase of 1,600 workers was posted in August, and a decline of 1,600 jobs showed up in September. If these numbers prove to be accurate, it is reasonable to raise the question: Which is the anomaly – the posted employment for July through September or the employment for October? The non-seasonally adjusted data shows the Colorado employment continues to post solid job growth. Approximately 59,700 jobs will be added this year. The state’s job growth is led by the health care, construction, and accommodations and food services industries. There are fears that construction growth will be constrained by the lack of trained workers. In addition, all of the state’s MSAs have shown solid to strong job growth. Local governments are continuing to spend and the state government is offering more tax incentives to out-of-state companies to move to Colorado. A review of the top news stories for the past month echoes the sentiment of state leaders (Office of state Planning and Budgeting and Colorado Legislative Council) who say that the economy is on solid footing. A majority of the coverage about the economy is very positive, however, there is one story that is unsettling. Union Pacific is laying off workers in Denver and BNSF is following suit in other states. While there is reason to be concerned about the individuals who are furloughed or laid off, there is greater concern because the railroads are facing decreased demand for shipments (coal, oil, agriculture products, and industrial products). This suggests there may be something fundamentally wrong with the overall economy, i.e. manufacturing may be woefully weak. Another note of concern, the state of Colorado is expected to take in record levels of revenue, yet it will experience a budget shortfall for a variety of reasons beyond the control of state legislators. Special interest groups are addressing this issue, but there is limited interest in their efforts. The bottom line is the Colorado economy is on solid footing, at least for the moment. On Friday November 20th, the BLS will release the state wage and salary employment data through October. In light of the release of U.S. employment earlier this month, the state data is likely to show solid job growth in most cases. This brief overview of the national economy sets the tone for the upcoming release of the Colorado data. • U.S. Consumer Sentiment is up as measured by the University of Michigan Consumer Sentiment Survey. • There was strong U.S. job growth for October – 271,000 jobs were added. • The U.S. unemployment rate continues to decline. Theoretically, the U.S. is at or near full employment and the economy is operating efficiently. • The ISM Non-Manufacturing Purchasing Managers Index is strong. • Construction spending continues to be strong. • Many companies are cash rich and they are strategically expanding through mergers and acquisitions. There are always reasons for people to feel jittery about the economy. • Since 2010 there have been concerns that the Greek debt crisis would unravel the EU. Those concerns reappeared earlier this year, but have subsided. • The summer volatility in the equity markets has subsided. The VIX has dropped from almost 41 in late August to about 17 on November 19th. Much of the lost ground has been regained. For example, the S&P 500 closed at 2,081 on November 19th, up from 1,868 in late August. • The inaction of the Fed to raise interest rates is reminiscent of a shy high school boy who is smitten with his first girl friend. He keeps thinking, “Is now the right time for me to kiss her.” And she is thinking, “He must not like me because he won’t kiss me.” While many agree that a rate increase is long overdue, the issue is the timing of that increase – just like that first kiss. Now is the time. Terrorism and the price of oil are areas that cause everyone to toss and turn at night. • It is unlikely we will ever get used to the “sick-in-your-stomach feeling” caused by ISIS and other terrorist groups. Their direct impact is psychological. Indirectly, consumers will be more cautious and businesses will be obligated to spend more on security. • For over a year now, the price of oil has disrupted the economies in Tier I oil producing states. In some states such as Colorado, production has remained strong; however, it will likely drop off as there is a glut of oil and a lack of storage facilities. Problems in the industry could be exacerbated by further declines in the price for a barrel of oil caused by the glut. Some industry experts project oil could drop to $20 per barrel. Holiday retail sales are projected to increase by 3.5% to 4.0% compared to last year and online sales will be double that amount. This is solid growth, but is an issue only in the sense that it is not stronger. The major concern about the U.S. economy is the manufacturing sector. The ISM manufacturing index has trended downward since August 2014 and has been near 50 for the past two months. Purchasing managers are ambivalent about the level of growth in their companies. At the moment the industry appears to be on the verge of a downturn. With this as a background, Coloradans should expect the upcoming BLS report to say that job growth will be much stronger than recent months.